Have you got designs on breakfast? Time to acknowledge those hard-working mummies! We hope you all had a great Christmas and New Year. All of us here at Team Bubblegum have young families, as do many of our beloved clients, so we thought we’d help you all little for next year. We’ve seen people referring to the savings challenge to save 1p per day of the year (1p on day 1, 2p on day 2, 10p on day 10 etc). Daily seems a bit too much of chore for us creative types, so we’ve complied this little poster to help you save once per week. 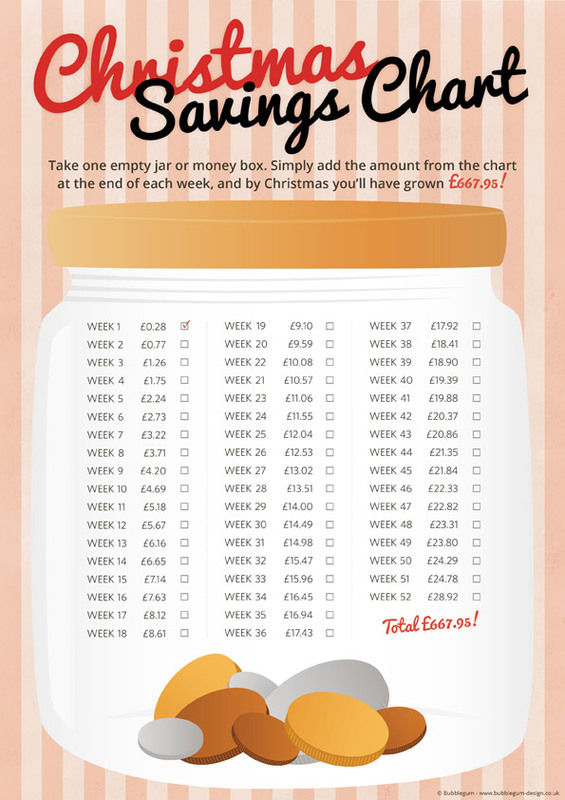 Find a jar or money box, stick this poster nearby and tick off each week as you save – if you stick to it you’ll have a whopping £667.95 by next Christmas you’ll have barely noticed it. Please help us help others by sharing among your friends and clients. They will thank you for it! Great idea – I did this last year with exercise DVDs (putting £1 in a tin each time) and found that I’d saved £122 by the end of the year. Great idea too! It’s so simple really – we’ll hardly notice it, especially in the early days but by the end of the year we’ll be so grateful. Thanks!